A guide to using inbound and outbound sales together to optimize your sales process. In our previous article, How to Build a Full Inbound Conversion Funnel, we described how companies need a full funnel to drive inbound and outbound sales investment in a profitable timeline. In this guide, we will show you how our clients and our agency have successfully implemented both to maximize results, and how participating in both inbound and outbound sales helps you prioritize marketing campaigns and sales initiatives and improve conversions, as well as how these affect your marketing and sales organizations. The primary goal of this article is to help you build or improve your current inbound AND outbound sales strategy to maximize results. But the ultimate goal is to give marketers and sales executives a core foundation on the topics of inbound and outbound sales. Our intention isn’t to provide a specific solution. Our goal here is to ignite ideas and provide a structure that has worked for us and our clients, one that you can use moving forward. If you’re reading this resource and have use cases or information to add or see that I’ve overlooked a critical point, please leave a comment. Disclaimer: Will this inbound and outbound sales guide fit my company? The guide presented below is just ONE of the ways that a company can improve inbound and outbound sales effectiveness. Please adjust and change this approach to fit your specific needs. Successful selling is more about education and solutions and less about products. In our guide, What Is Outbound Sales? Everything You Need to Wrap Your Head Around the Outbound Sales Conversation, we point out that following an inbound-outbound approach is the foundation of a successful sales strategy. Before we jump into describing how to maximize results, let’s start by quickly defining two important terms. To establish an effective inbound sales funnel, you’ll need to create a variety of unique content to support buyers in each of the stages listed below. When you provide your buyers with the education and resources they need, you can nurture them down the funnel, dramatically increasing the number of qualified leads (BOFU) that are being delivered to sales. The graphic below demonstrates how buyers are nurtured through the stages of the B2B and B2C inbound sales funnel, effectively putting your lead-generation system on autopilot. It refers to the TOFU, MOFU, and BOFU stages, as they are more commonly referred to when referencing The Buyer’s Journey. Outbound sales is a company generated, (typically) single-channel path toward a purchase conversion. Now that we have those simple definitions established, let’s examine how your ability to maximize results will be tied to your company’s growth stage. The structure of your inbound and outbound sales approach depends largely on your company’s growth stage. Inbound and outbound sources aren’t equally important for every stage of a company, and keep in mind that this high-level strategy can be applied to many industries and verticals. However, we’re going to center this resource around a SaaS/enterprise example of how to most effectively blend inbound and outbound approaches. Whether this matches your vertical and business type or not, follow along and use the insights we share here to improve your own sales systems. At each of these stages, FIT and PAIN have different implications and outcomes. When you view your sales efforts in terms of FIT and PAIN you begin to see each channel from your prospect’s point of view, thereby uncovering one of the first ways to maximize results. Does this prospect experience the pain that our product or service solves? How great is this pain relative to other pains and challenges that this prospect faces daily? What are the typical issues our prospect is facing that aren’t directly tied to our commercial offering? Now for one of our keys to our sales process, FIT. Is this prospect a good fit for our offering? Do they have the budget to pay for our product or service? Does he/she have enough resources to implement our offering? Do we have a process to learn the information needed to determine if we’re a good fit to help the prospect solve their problem? Combining inbound and outbound sales initiatives allows you to prioritize your content marketing campaigns by helping you to identify three distinguishing factors about your buyer’s journey. Who knows more about the questions your buyers are answering than the people talking to them every day? With a combined inbound/outbound sales effort, you’re able to identify what information gaps exist in your current buyer’s journey so that you can work to fill them with detailed content. Prospect objections can also be answered in a similar manner to information gaps in the buyer’s journey. With inbound and outbound working as a single cohesive unit, sales can eliminate the need to field the same objections and answer the same questions that regularly come up during their communications. Instead, when an objection arises, a salesperson can respond with an article or two that help to quell objections and eliminate the need for further questions and explanations. What’s even better is that the prospect has the opportunity to discover the same content, removing the scenario from the sales process altogether. Finally, if there are missing pieces of content that would otherwise support the closing of a deal or multiple deals, that content can then be prioritized to facilitate a quick win. This actually came up in our own sales process recently. When a SaaS prospect asked about our experience in SaaS marketing, we noticed our content repository was completely devoid of SaaS marketing content. We had been serving multiple SaaS clients for nearly two years but had yet to write about it. Within a week we had our SaaS Marketing Guide produced and have been able to pass it on to multiple SaaS prospects since its creation. When you have an inbound and outbound program in place, your outbound conversion performance and results will improve by having content that aligns with a prospective buyer’s journey stage, objection, or problem—likely pushing the prospect over the edge in favor of your company. You’ll find that having a variety of content in the form of slide decks, blog posts, white papers, videos, and webinars enables your sales reps to provide prospects with true value instead of annoying product/sales-focused communication. For example, the content outlined above is a foundational component of effective social selling. Without it, social sales would be far less effective. Delivering as much upfront value in as little time as possible translates to a momentum that engages more prospects and closes more deals. Pairing your inbound and outbound allows you to merge your entire sales and marketing funnel into a single, efficient machine. Rather than having unique components accomplishing different tasks, a single mechanism is formed that works together to accomplish one overarching goal. Most companies track and measure conversion rates, which they should. But what happens when the activated outbound prospect is non-responsive and doesn’t convert into an appointment? Those who don’t convert into a sales conversation are often seen again in the form of branded search traffic. When sales reps reach out, the prospect’s first reaction isn’t to take the call, but rather, to look up the company online. This will trigger a search for the company name. Additionally, if you have the content and early-stage conversion points in place on your website, these outbound sales-generated visitors can complete an online form and thus get identified as a Marketing Qualified Lead (MQL). Alternatively, outbound emails and calls can be more purposeful with this formula by recommending a resource or guide as a first or second touch which directs the outbound prospect into the marketing funnel. Even if you have a 40% first touch-to-appointment rate, you’re still missing out on the bulk of the cold prospects who aren’t yet ready to make a purchase. Using outbound sales to create MQLs is a highly untapped formula for maximizing your ROI from inbound and results from outbound. Now that we’ve identified the benefits of teaming inbound and outbound sales, let’s take a look at how to effectively implement both to maximize your results! The first step you’ll need to make is to build a documented sales process. Sales without a documented process is like marketing without a strategy. Your sales process needs to be expertly crafted and documented so it can be expertly executed by each member of your team. Lucky for you, we have an expert guide on developing an effective sales process. Part of an effective inbound/outbound sales process is identifying and documenting your ideal buyer personas and any additional personas that you’ll be pursuing through each channel. Taking the time to get clear on who it is you’re selling to and documenting those characteristics will allow your entire organization to have a clear picture of exactly who you’re trying to close. This step is so important that we’ve created this step-by-step guide to creating buyer personas. As inbound and outbound come together, outbound can best support inbound by creating a long list of buyer questions and objections from which the appropriate content can be generated. Taking the time to produce this list will allow content assets to be generated that will allow you to optimize your sales process, reduce the time involved in closing prospects, and increase the total number of deals you’re able to close. While you’re creating your list of buyer questions, it’s important to also define the triggers, or problems your prospects are needing to solve, as well as the questions they have about solving these problems in each stage of the buyer’s journey/sales funnel. These triggers will give you the foundational information on which you’ll build your inbound process. Documenting these triggers will also allow you to take the benefits described in the previous section even further. Next up is building an inbound funnel. The process of building a FULL inbound funnel is well beyond the scope of this post. 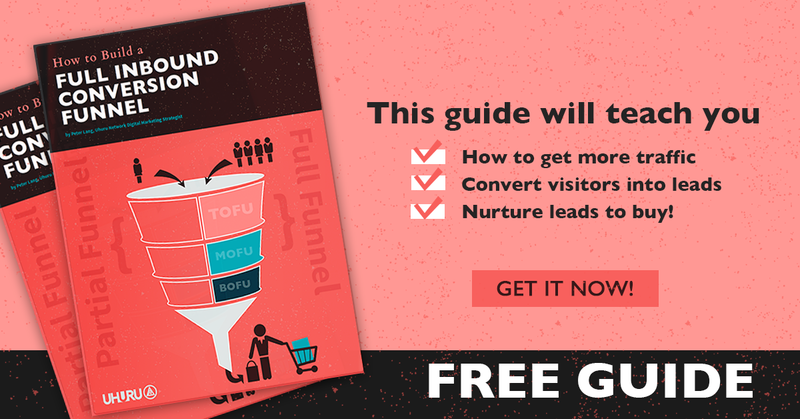 If you are needing assistance building the inbound sales funnel, we’ve created a guide on the process of building a full inbound conversion funnel. Once you have your sales process developed, it’s time to get working on the playbooks that your team will use to direct their sales communications. These playbooks should include recommendations on content to support various stages in the outbound sales process as you work to blend your inbound and outbound efforts. In theory, integrating inbound and outbound into a single sales process sounds incredibly helpful and efficient. However, it will take time for your team to get used to working this way. One way to facilitate their acceptance and understanding of how to do so is by running role-play exercises. The more you’re able to practice before integrating it into real-world sales communications, the more skillfully they’ll be able to integrate it into their organic communication and the more effective their process will be. Enable your sales team to be more effective by automating notifications based on prospect behavior. That way your sales team has a predetermined purpose and value when reaching out to an interested lead. HubSpot allows you to use progressive profiling to gather more valuable information about a prospect as they move deeper into your sales funnel. The beauty of this functionality is that it doesn’t ask for all of a lead’s information at once. Instead, once a field has been completed your lead will never need to fill it out again. The next form the prospect encounters will ask new questions and gather new information as they move from stage to stage in their buyer’s journey. Furthermore, you can set specific criteria (lead scoring) for your marketing qualified leads (MQLs) and Sales Qualified Leads (SQLs) within HubSpot. Once you have the information collected on forms (Progressive Profiling) and/or lead scores indicating a contact qualifies to be an MQL, you can use HubSpot to build a Sales Enablement Workflow. This will automatically send an email to your sales reps once these events have occurred. Establishing a level of sophisticated automation like that outlined above allows you to allocate your sales resources as efficiently as possible, effectively leading to more deals closed and higher profits. If you’re not already aware of the power of Facebook retargeting, our Guide to Facebook Retargeting is a must read. It’s the most comprehensive guide available on one of the most powerful marketing tactics in existence today. It’s that good. Simply put, retargeting on Facebook is advertising to prospects who have visited your website but have not yet converted. You can also use retargeting to put your valuable content in front of those same people, effectively allowing you to continue nurturing them through the buyer’s journey and toward a conversion. You can even create specific campaigns that show relevant content to prospects who have visited certain pages of your website to ensure the content they are being shown is as relevant to their buyer’s journey as possible. Inbound and outbound sales were once considered to be two unique ideologies that were difficult to blend. Today, your sales process will be hindered if you neglect integrating the two. By now you understand the benefits, but it’s up to you to implement the process outlined in this guide to create an optimized sales process that makes the most of your inbound and outbound sales activities. Take the time to document your new sales process, train your team, and optimize it as you put it into practice, and you’ll see your sales resources used more efficiently and your close rate climb. In my opinion, the outbound sales are better, as you can reach more customers with it. However, it requires a whole lot of work, dull and repetetive. That`s why I use special software, like proofy and remail. It is really helpful to automate outbound sales.